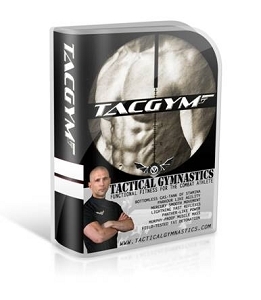 Tactical Gymnastics (TACGYM) synthesizes bodyweight-only exercise from more than 20 of the world's top disciplines such as Russian Systema, Slavic Zdorovye, Chinese Bagua, Persian Zurkhane, Indian Vyayam, and Brazilian Gymnastica. This low and moderate intensity movement system features 12 workout missions (3 missions with 4 levels from beginner to advanced), a 79 page instructional manual with color charts and 24 instructional and follow-along videos. Each workout can be completed in 20 minutes, includes simple, easy to understand progressions so that you can begin anywhere at your level. In addition to the primary missions, you will find a dedicated lower-body yoga stretch routine with 3 levels, an upper body dynamic mobility routine using a staff or wooden dowel rod, and a unique myofascial release routine using a tennis ball, totally an additional 10 extra bonus instructional and follow along videos to accompany the primary course material.